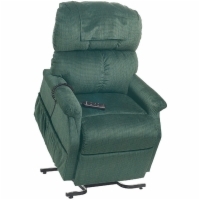 Zero Gravity position lift chairs have dual motors like infinite position lift chairs, but add the ability to recline into the "Zero Gravity Position". This position puts your legs above your heart and creates an open angle between your torso and thighs. This position is often recommended for people who have circulation issues, lower back pain, or reduced long capacity.